Morinaga Continues Aggressive Expansion in U.S.
(Irvine, California) February 28, 2016—Morinaga America has announced two more additions to its rapidly expanding product line. The first is Hi-Chew Bites. As the name suggests, Bites are a smaller version of Hi-Chew candy. Each piece features a thin candy shell for quick and easy snacking. 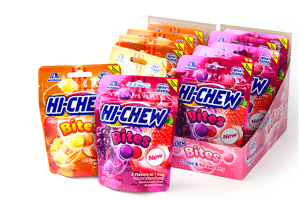 The second addition to Morinaga’s product line is a 7-ounce gusset bag of original Hi-Chew. 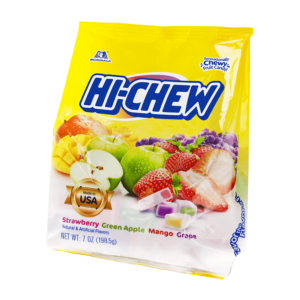 The new bag is the latest “Made in USA” product from Morinaga’s factory in North Carolina, and contains individually wrapped pieces of Hi-Chew in Strawberry, Green Apple, Mango, and Grape.